The Pyle PPHP837UB PA Loudspeaker is the ultimate high-powered cabinet system. It comes loaded with features including an impressive 600 watt power output, 8'' subwoofer, USB flash drive reader, SD memory card reader and plenty more to add full-range, distortion-free sound where you need it! Just plug it in and you're ready to play your favorite MP3 digital audio files. 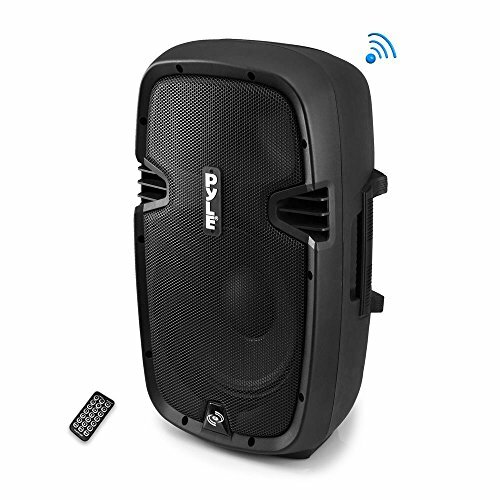 HIGH-QUALITY SOUND REPRODUCTION: Pyle PPHP837UB pa system is equipped with a heavy duty self powered 8 inch subwoofer for ultimate bass. Packing a powerful 600 watts this self powered speaker effectively reproduce the entire studio audio spectrum and will not get drowned out in even the largest venues. GREAT FOR ANY VENUE: The handle makes transporting these professional stage speakers from home to the concert simple. Built in port allows you to setup the compact DJ sound system speakers on a standard mount rack. The high, mid and bass frequency knobs allow adjustment for outdoor or in a church. BUILT TO LAST: Protected by a circuit and engineered abs box construction this amplifier is built to last. Complete satisfaction guaranteed! We stand behind this product with a limited 1-Year manufacturer's warranty. Contact us If the item show any defect we'll repair or exchange it for a new one. Bluetooth Wireless Music Streaming Ability - Works with Bluetooth Compatible SmartPhones (iPhones), MP3 Players, Tablets, etc.